Migrating from a Standalone Dreamworld to a Gridded Dreamgrid requires you to take special steps. Start your original Dreamworld. Dump the database by clicking the Content-> Backup Database menu. This makes a backup in the AutoBackup folder in the Standalone Dreamworld. I then created a new Grid, but set the robust name to opensim and the robust userid to opensimuser and the robust password to opensimpassword. These are the same as in the lower section for the Regions database. I also filled in the various Setting menus for the name and ports to match the original Standalone Dreamworld. I then clicked [Start]. This boots Mysql on the new grid. It then starts Robust and a new Welcome region ( even if it has the same name, it has a random UUID so will be different). I created a Test User in Robust to get it to boot up. Then shut the grid down gracefully by clicking [Stop]. This left the Dreamgrid menu enabled and MySQL running. Navigate to the Dreamgrid's Content->Restore Database menu and browse to the original Dreamworld's Autobackup folder. Click the .sql file you just made. This will load the Opensim.sql file into the new grid. You will need to move your region.ini files using a special drag and drop mecchanism. You cannot just copy them over in a file explorer unless you make a special pattern of folders. Open the Region Panel with Ctr-R, or go to Setting->Region. Delete the existing Welcome region. There will be anywhere from one to many Region.INI files in your old system. There si no need to load from OAR files. Use the windows explorer and navigate to the original Dreamworld location on your disk. Look in Outworldsfiles\Opensim\bin\Regions. If you are running 0.9.0, look in Outworldsfiles\Opensim-0.9\bin\Regions. 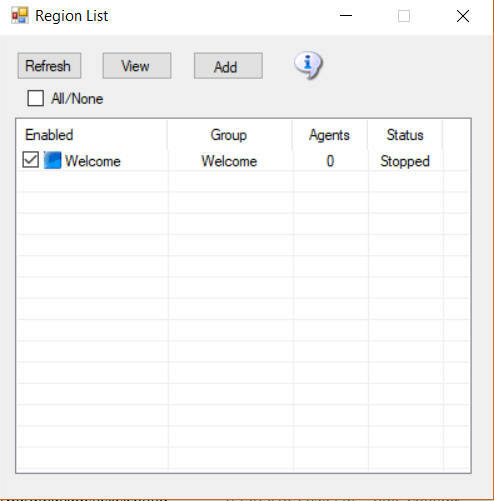 Left click each region, one at a time, and drag and drop it onto the Regions panel. Yes: If you answer Yes, a Chooser dialog will appear. You must chose which region you want to combine your new region with. This places both regions into a single DOS box. No: If you answer No, you will get a different DOS box when this region starts. You should limit the number of DOS boxes by combining your regions into logical groups. A typical system will run 4 to 8 such groups. You can run more, but you will pay a penalty in RAM use for each box. Now click [Start] to boot the new grid. You can log in with the Standalone grids user names at this point. Your inventory should be there. The regions will appear.